One Finnish man Shatraug (real life name Ville Pystynen) receives a lot of coverage on our site, and elsewhere, with his two main bands Horna and Sargeist. Deservedly so. His less known project Mortualia, where Shatraug handles every instrument and vocals himself, plays a lot more depressive and, dare I say, a lot more personal brand of black metal. Whereas Horna and Sargeist often tend to rock, Mortualia just plan distresses and devastates. Moribund does its best to unearth Mortualia by re-issuing the second album by the band, 2010 Blood of the Hermit. When I heard the album for the first time I was only able to take it in small portions, but as a good drug, Blood of the Hermit makes one addicted. Before too long, I noticed myself playing the album on repeat, reaching out for its endless 10-12 min compositions, especially when in dejected, not-interested-in-life mood. When you are in the right state of mind, if you let it, Blood of the Hermit, will absolutely wall you off from the outside reality, providing the grounds for an incredibly contemplative experience. And you would not need any real (read, chemical) drugs to reach the state of transfixion. Becoming Meaningless and The Sinister Shine are dense funeral dirges with Becoming Menaningless showing slim signs of hope towards the end, whereas The Sinsiter Shine longs for it around 3rd and 7th minute. 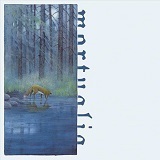 Ultimately, Mortualia rejects and shatters hope in those cuts, guitar strings touching deep into the soul around 2nd minute of Becoming Meaningless, before the composition collapses under its own weight. Absolutely horrid blood-curdling soul-tearing screams substituting for vocals and endless repeating ephemeral melody delivered via thin tubed production continue to envelope and suffocate. (Swedish Silencer is the only other band I know to have vocals so extreme). Manic Euphoria takes on a slightly different approach, preferring to kill with THE riff - persistent, archaic and largely malevolent. The tempo spiral begins to wind a little tighter around the 6th minute bringing on the aura of grim inevitability. Manic Euphoria is not for the weak of heart. If depressive music leads you not to be able to live with yourself, Manic Euphoria should not be taken lightly. The title track is almost the only place on the album having a little warmer guitar tone, still carrying that sad pangy feeling. Pain At Least … maybe has a little more pronounced drums in its body, and judging from its title it is probably good to feel ANYTHING, in Mortualia’s world, ANYTHING but total catharsis. If the saying that “brilliance comes from simplicity” is true, Mortualia reinforces that theorem with Blood of the Hermit. Pain and desperation are delivered masterfully by Shatraug, seemingly with very limited resources.